In the past, gold therapy was the standard treatment for moderately to severely active. Gold compounds were used to treat rheumatoid arthritis since 1929. Gold was actually developed as a treatment for tuberculosis. At that time, it was mistakenly thought that tuberculosis and rheumatoid arthritis were related conditions. While that proved to be incorrect, gold did show a beneficial effect on rheumatoid arthritis. While the mechanism of gold's anti-inflammatory effect is not fully understood, evidence suggests that gold is stored in lysosomes whereby it inhibits the processing of antigenic agents (any substance that stimulates the production of antibodies) and the release of proinflammatory cytokines. It is therefore classified as a disease-modifying anti-rheumatic drug (DMARD). Parenteral forms of gold are injected and include Myoschrysine (aurothiomalate) and Solganol (aurothioglucose). Ridaura (auranofin) is oral gold therapy. Over the years, as newer treatments became available that offered superior benefit and less risk (e.g., other DMARDs and biologic drugs), gold injections were rarely prescribed for rheumatoid arthritis. Its use diminished primarily due to the risk of side effects, as well as the need for close clinical and laboratory monitoring, and the inconvenience of intramuscular injection. Gold shots are administered as an intramuscular injection in the doctor's office weekly for the first 20 weeks of treatment and then the frequency is tapered to every three or four weeks. A blood count and urine test are recommended prior to each gold injection, to make sure it is safe to give. 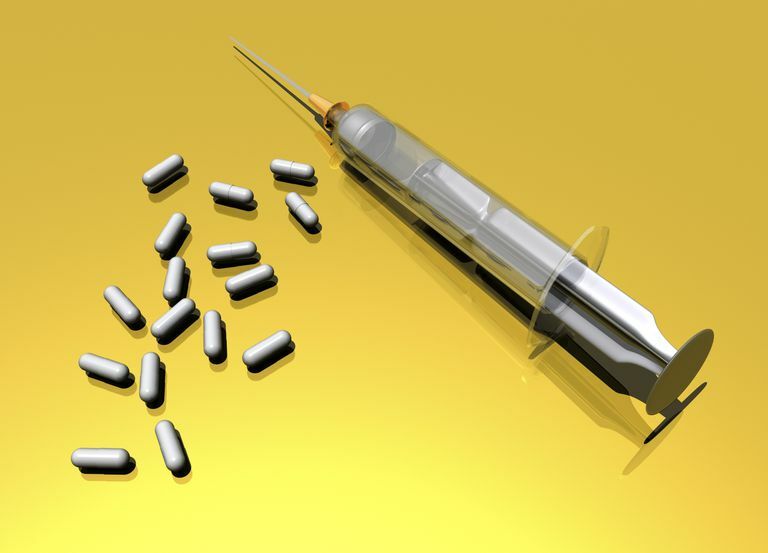 At first, intramuscular injection of gold is usually administered as a small 10-milligram dose, once a week. A second 25-milligram dose follows and then 50 milligrams a week until a response is achieved, up to a total of 750 to 1000 milligrams. Side effects, the most common reason for discontinuation of gold therapy, affect about 30 percent of people treated with parenteral gold compounds. The most common side effects associated with parenteral gold include pruritis, dermatitis, stomatitis, and proteinuria. With oral gold, loose stools are a common side effect, while watery diarrhea occurs less often (affecting up to 5 percent of patients). Nephropathy and thrombocytopenia can also develop with gold therapy, especially in those positive for the HLA-DR3 gene. While potential side effects have been the downside of gold therapy, it must be noted that gold injections placed some people with rheumatoid arthritis into permanent remission. Rheumatologist Scott J. Zashin, MD commented, "As a result, if a patient has gotten a good response to gold injections, they are typically continued. Stopping the gold in these patients may trigger a recurrence of arthritis activity which may not respond to the resumption of therapy with gold." However, as gold shots became less utilized and as newer treatments were developed, companies stopped making the medication. While there were two formulations of gold shots at one time (Solganol and Myochrysine), only Myochrysine is now available. Often, patients develop a reaction to it, making discontinuation necessary. Unfortunately, oral gold produced only minimal beneficial effects, so it was uncommonly prescribed. Ridaura, the oral gold preparation, may still be available, but it is rarely used in the United States. Oral gold was shown to be moderately effective when compared to placebo. It was considered equally effective to Plaquenil (hydroxychloroquine) and methotrexate, but with greater potential for toxicity. Gold is an older DMARD (disease-modifying anti-rheumatic drugs) which has, in nearly all cases, been replaced by newer DMARDs and biologic drugs. The use of gold is mostly reserved for patients who do not respond to or cannot tolerate methotrexate, other older DMARDs (such as Plaquenil and sulfasalazine), or TNF blockers. Cush JJ, Weinblatt ME, Kavanaugh A. Rheumatoid arthritis: early diagnosis and treatment. West Islip, NY: Professional Communications; 2010. Klinkhoff A. Major side effects of gold therapy. UpToDate. https://www.uptodate.com/contents/major-side-effects-of-gold-therapy. Klinkhoff A. Use of Gold Compounds in Rheumatic Diseases. UpToDate. https://www.uptodate.com/contents/use-of-gold-compounds-in-rheumatic-diseases?source=see_link.